Richard Philbin was diagnosed with pancreatic adenocarcinoma in February 1998, at the age of 65. The tumor was 1.5 cm and found in the head of the pancreas. He underwent the Whipple procedure a month later. Chemotherapy was 5FU. Care was received at the Dartmouth-Hitchcock Medical Center, Lebanon, New Hampshire, in its NCI-designated Norris Cotton Cancer Center. His surgeon was Dr. Richard J. Barth; his oncologists were Dr. J. Marc Pipas and Dr. Herb Mauer. Richard’s primary caregiver, his wife Ginny Philbin, also contributes to this story. Richard and Ginny live in Quechee, Vermont – a small vacation/resort community, luckily just over the state line from the Dartmouth Center. They’ve been married almost 49 years and have four grown children, all living elsewhere. Richard, now retired, had several different careers – ranging from comptroller of a subsidiary of a large health care company, to software trainer of a small family-owned computer firm, where he was working when diagnosed. Ginny is a dietitian with a nearby Veterans Administration hospital. The all-important early diagnosis was aided by two factors: a) noticeable jaundice symptoms; and b) a pushy wife! After a few days of putting up with Richard’s own first strategy for dealing with the symptoms (drinking lots of water?? ), Ginny strongly suggested he move on to an actual visit to their family physician. Dr. Michael Kilcullen not only was an excellent diagnostician, but his connections to Dartmouth-Hitchcock also expedited the intervening testing process and led to prompt action. Richard went to great lengths to keep the full story from Ginny until she returned home from her trip. “Actually, I had been under the impression he was having problems with his gall bladder. I had had gall bladder surgery myself, and I knew his problem was in the same general area.” So it was in their driveway several days later that Richard first said the words “pancreatic cancer.” But Ginny had no background in the special attributes of this particular disease. And “he said it so nonchalantly” (as if, it’s not the gall bladder, it’s the appendix…), that she remained blessedly in the dark for a brief while longer. The clinical trial option was presented, and Richard seriously considered it – partly because of his strong interest in seeing his own experience potentially help others. But the study would involve delaying surgery to engage in an experimental radiation treatment. After a second opinion, he decided instead to capitalize on the good fortune of early diagnosis, and to proceed immediately to surgery. As it turned out, that clinical trial did yield highly promising results. 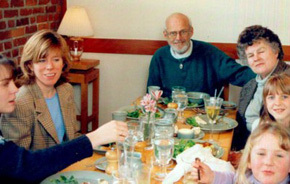 Richard underwent the Whipple procedure at Dartmouth-Hitchcock in mid-March of 1998. The original plan had been to do some radiation during surgery, but the painstaking removal of his unexpectedly damaged gall bladder extended the procedure to the point where that could not happen. He was in the hospital nine days, on nutrition IV, transferring through stages to regular food within several weeks. As with many patients, he also had one post-operative infection, and recurring nausea. More unusual was his tenure with the nausea, which continued several times a week from post-op through the end of chemo, over a year later. During treatment, Richard did not explore alternative therapies, for the most part. However, a book on visualization turned out to be mildly helpful. “I’m not generally into such things. But during my chemo, I did experiment with imagining exactly how it was working inside my body to fight the cancer.” Nothing too remarkable on the nutrition and exercise fronts, either. Richard and Ginny had been keeping a pretty healthy lifestyle before the surgery, and continuing the good food and a daily multivitamin were the extent of the recovery plan. Unfortunately a mid-distance running regimen, which Richard had long enjoyed, has been challenging to resume post-operatively. But their rustic property provides ample opportunities for outside exercise of the chore variety. At the end of chemo, many people experience a new wave of anxiety, as that long-term form of ammunition against the cancer is suddenly removed from the arsenal. Richard, already long since committed to beating this disease, had no such problems. To him, the end of treatment felt more like graduation day. Family – Richard and Ginny are nearing their golden anniversary, so have a long history of supporting each other. And within minutes of a first call to a cousin, word of the diagnosis was telegraphed to their large extended family around the country. The Philbin children, spread out across the country as they were, were also supportive, and able to be present during the hardest stretches of surgery and early treatment. Richard is a “practicing” Irishman with a jaunty white beard, which on St. Patrick’s Day he always dutifully dyes green. When Richard woke up from the Whipple, it was difficult to talk, so he motioned his daughter to give him a nearby pencil and paper. “What day is it?” he wrote. “Still March 17th”, she replied. Noticing that the pen she’d passed him was coincidentally a green felt-tip, he immediately proceeded to do what the date required: color that beard. A “real time” support group convened at the medical center, for that same audience, provided a network of like-minded others right in the same geographic vicinity. And sharing his experience and advice with other patients, whether in person, by phone or online, has been its own personal resource in helping Richard deal with his situation. Cancer Buddies: Two fellow patients played a special role. Richard first met Greta and Carol through the ACOR listserv group, but also communicated with them off-list and (in the case of Carol and her daughter Jan) even in person. Comparing and learning from their similar journeys was a unique form of help to him with his own, and the subsequent passing of both women was deeply and personally felt. To fellow patients and caregivers – Don’t be afraid to ask for help. For patients who have long been helpers themselves, it seems this act can be extra hard. To caregivers – Don’t get to the cemetery before the patient does. It’s easy to sense grim foreboding in loved ones, and whether the patient shares that feeling or doesn’t, it makes their job of healing tougher. As told to Alison Wiley, an oral historian working with people and organizations to recall and record their important stories.